The Ottawa Police Service West Criminal Investigations Unit and Crime Stoppers are seeking the public’s assistance in helping to identify two suspects who are responsible for mischief to religious property. 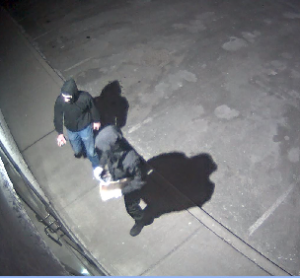 In the overnight hours on January 30th 2018, the two suspects attached hate posters to a mosque located in the 3900 block of Richmond Rd. The posters were glued to the building. Suspect 1 – Black Hoodie with a black balaclava, blue jeans and black shoes. Suspect 2 – Dark Grey or Black winter jacket, black pants and black boots. Please see photos provided by investigators. If you know the identity of the individuals call the Ottawa Police Service West Criminal Investigations Unit (613) 236-1222 Ext 2666 or <strong>Crime Stoppers</strong> toll-free at 1-800-222-8477 (TIPS). Remember Crime Stoppers does not subscribe to call display, we will not ask your name or record your call and you are not required to testify in court. If your information leads to their identity, you could qualify for a cash reward of up to $2000. You can follow us on Facebook, YouTube and Twitter.